Over the last couple of months we have been trialling our new walking club – with, it has to be said, only limited success. However, we have learned a bit along the way and now it’s time to regroup, relaunch and put our best foot forward! 13 years ago, I broke my ankle in 3 places. Now fully, pinned, plated and bolted, it still gives me a bit of bother. I have promised myself for years to do more walking, to help strengthen my ankle. So, when Glenn suggested I take on the Shrewsbury Family Chiropractic Walking Group it seemed like the perfect opportunity – no more excuses! The first few walks we did, (if I am honest) did play havoc with my ankle. By evening, it was swollen and sore and I was still struggling for the first few days afterwards. A few weeks in, it has certainly improved – yes, it is still sore and swollen in the evening, but not as much and it recovers more quickly than before. Which just goes to show that keeping to a plan really does work. Start your week off right and join us for a walk – make it a reason to commit to your personal goals, meet other members of the ChiroTribe, share your chiropractic story, offer support to each other and share your inspirational ideas, whether it be healthy recipes, exercise ideas or personal goals. If we get a few loyal attendees, we can look at introducing a weekly step challenge and maybe even create a ‘walking group Facebook group’ so you can stay in touch with each other between walks. Please note that we will be trialling Walking Group until the end of July so, if it is something you value and would like to see continue, don’t wait! 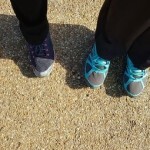 Make our Monday lunchtime walk part of your weekly exercise routine – now!